It is understood the golf swing places large amounts of stress on the lower back. This is simply a result of the mechanics of the golf swing itself. The golf swing, lower back, and injury are common phrases in the world golf. The execution of the golf swing places the lower back under immense shear forces each and every golf swing, and the muscles of the lower back must withstand these shear forces. Muscles of the body when under stress from physical activity eventually become fatigued. Once the lower back muscles are fatigued, supporting the stressors of the golf swing and executing the mechanics of the golf swing are compromised. Resulting in some very common situations for the golfer. Again, we are all aware the lower back is one of the most oft injured areas of the body in the game of golf. Statistics indicate approximately 50% of all golfers will incur a lower back injury during their playing careers. This statistic tell us a great deal about the importance of keeping the lower back healthy in the game of golf. Outside of the lower back becoming injured from the golf swing. The situation of performance on the golf course comes into play. This is a result of the fatigue within the lower back not allowing the mechanics of the golf swing to be executed correctly. Often times prior to injury occurring, a drop in performance will occur. We know the lower back is placed under high amounts of stress every single swing of the golf club. Over time the muscles of the lower back can become fatigued from the golf swing. This will eventually lead to the muscles of the lower back “giving up” and becoming fatigued. Once the muscles of the lower back are fatigued it is a very short step to injury. What is the process of eliminating this type of scenario playing out? It simply requires the development of muscular endurance in the lower back to withstand the stressors of the golf swing. 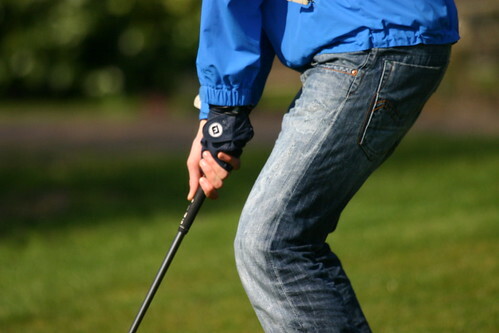 Bottom line the golf swing is a repetitive movement, requiring the body to perform the swing over and over again. In order for the muscles involved in the golf swing to perform the repeatable movements of the golf swing over and over again in an efficient manner. Muscular endurance is the ability of the neuromuscular system of the body to perform a repetitive biomechanical movement without becoming fatigued. In addition to the development of increased muscular endurance the efficiency of the golf swing mechanics may require adjustment. Efficiency within the mechanics of the golf swing can directly affect the amount of stress placed upon the lower back. Additional research has indicated the shear forces placed upon the lower back of a professional golfer is significantly less than the amateur golfer. The reason for the difference is the mechanics of the golf swing performed by the professional is much more efficient, placing less stress on the lower back. If the lower back is weak the shear forces placed upon it by the golf swing will eventually lead to fatigue. Stated previously, numerous reasons exist for the lower back to become injured. The mechanics of the golf swing and endurance with muscles of the lower back are only two of many possibilities. The development of higher levels of muscular endurance can counter act this situation. The utilization of golf fitness exercises is best in relation to the golf swing for this situation. Additionally, the efficiency in which the mechanics of the golf swing are executed affects the lower back. A comprehensive golf fitness program to develop higher levels of muscular endurance and the creation of a efficient golf swing golf through instruction may assist keeping your lower back injury free. A less efficient golf swing places higher levels of shear force upon the musculature of the lower back causing fatigue and possible injury. Really educative thanks, I’m sure your trusty subscribers may perhaps want far more items similar to this, continue the good work.